We're not going to speak of how long it's been since I last posted *looks guilty* or listed something new in the shops (despite having plenty to list!). What we are going to talk about is renewal and growth and cycles. I am an introvert clean through and pretty much any literature on introverts will tell you that we need our "me" time in order to recharge and recoup and take on the world. This turtling behavior doesn't just apply to social interactions though. I find that if I get stressed out or overwhelmed, I often back off many things that I *should* do in an attempt to get my balance back. And once I have destressed, relaxed, or gotten through the major crisis of the moment, I suddenly have more interest and energy again. Sadly, I have yet to find the magic bullet of "just do this" and then feel up to snuff. In part because of all the *guilt* that goes along with not doing what you feel like you should be able to do. So, after some time to hole up, and with the crisp fall air and the nice chill the mornings have taken on, I am feeling more centered, more grounded, more *balanced*. And my desire to list and blog and be active has resurfaced. Timed along with this is a whole new look for my MrsDragon shop. 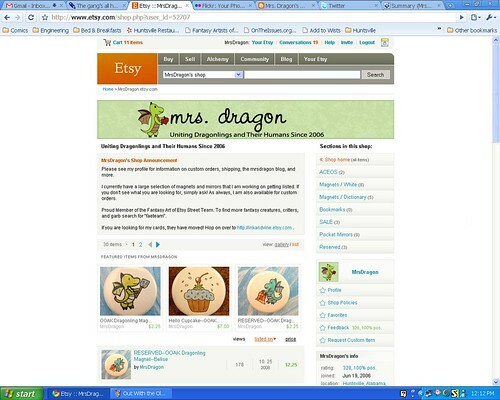 A while ago, I contacted Bitsy Creations regarding redoing my shop logo. You see, I loved my current look, but there was one small problem. The dragon on all of my marketing materials bore very little resemblance to the dragons I was actually selling. So people who liked one, wouldn't necessarily like the other. Now on Etsy this is less of a problem, since people are more likely to find your things by searching items anyway. But for things like craft fairs where all someone has to remember you by later is your business card...it probably wasn't helping me. Love the new look AND the motto! I'm glad you like the motto, I *agonized* over that.Lol! Looks great! Love the tag line.